Vaccines represent a significant potential means of decreasing global morbidity and mortality due to malaria. Clinical trials in the United States with Plasmodium falciparum Apical Membrane Antigen 1 (AMA1) showed that the vaccine induced biologically active Abs judged by an in vitro parasite growth inhibition assay (GIA). However, the same vaccine in Malian adults did not increase biological activity, although it elevated ELISA titers. Because GIA has been used to evaluate the biological activity of Abs induced by blood stage malarial vaccine candidates, we explored this discrepancy in this study. We affinity purified AMA1-specific Abs from both U.S. vaccinees and nonvaccinated individuals living in a malaria-endemic area of Mali and performed ELISA and GIA. Both AMA1-specifc Abs induced by vaccination (U.S.) and by natural infection (Mali) have comparable biological activity in GIA when the ELISA titer is normalized. However, a fraction of Malians’ IgG that did not bind to AMA1 protein (Mali-non-AMA1 IgG) reduced the biological activity of the AMA1 Abs from U.S. vaccinees; in contrast, U.S.-non-AMA1 IgGs did not show a reduction of the biological activity. Further investigation revealed that the reduction was due to malaria-specific IgGs in the Mali-non-AMA1 IgGs. The fact that both U.S.- and Mali-AMA1-specific Abs showed comparable biological activity supports further development of AMA1-based vaccines. However, the reduction of biological activity of AMA1-specific Ab by other malaria-specific IgGs likely explains the limited effect on growth-inhibitory activity of Abs induced by AMA1 vaccination in Malian adults and may complicate efforts to develop a blood stage malaria vaccine. The malarial parasite remains a scourge on human civilization. Snow et al. (1) estimate that there may be 300–500 million clinical cases of malaria annually, and the World Health Organization Commission on Macroeconomics and Health has found that malaria reduces economic growth in sub-Saharan Africa by >1%/year (2). As the burden of disease and death due directly and indirectly to malaria has increased, the need for an effective vaccine has also assumed greater importance (3). Of the major vaccine candidates directed against blood stage malaria parasites that are responsible for the pathology associated with this disease, Plasmodium falciparum Apical Membrane Antigen 1 (AMA1)6 is one of the best studied (4, 5). AMA1 appears to play a pivotal role in erythrocyte invasion (6), participating in the attachment and reorientation of the merozoite to the host RBC surface (7, 8). Various pieces of evidence from both nonhuman primate models (9, 10, 11) and human epidemiological studies that have shown that a high AMA1 Ab level is associated with a reduced risk of clinical malaria (12, 13) support AMA1 as a promising blood stage malarial vaccine candidate. In addition, AMA1 Abs from individuals who live in malaria endemic areas can inhibit the invasion of erythrocytes by P. falciparum merozoites in vitro (14, 15). Our previous studies (16, 17) have shown that in clinical trials conducted in malaria-naive individuals in the United States, the AMA1-C1 vaccine (a mixture of two recombinant proteins based on the 3D7 and FVO allelic forms of AMA1) induces Abs that can inhibit in vitro parasite invasion and/or growth, as judged by the growth inhibition assay (GIA). In these studies, there was a strong correlation between the Ab level as measured by ELISA and the biological activity as measured by GIA, in agreement with previous studies in animals (18, 19, 20). However, this was not the case in a phase I clinical trial of the same vaccine conducted in Malian adults (21). Before vaccination, the Malian volunteers already had measurable AMA1 Abs, presumably due to previous infections with P. falciparum, and the total IgGs isolated from their baseline sera showed growth-inhibitory activity of the parasite in vitro. Although levels of AMA1 Abs increased significantly from baseline after two immunizations as judged by ELISA, the biological activity of the total IgGs remained unchanged for most of the volunteers, and there was no significant correlation between change in AMA1 Ab level and in degree of growth inhibition (21). At present, no in vitro assay result has been shown to predict clinical protection against blood stage malaria, because no effective blood stage vaccine has been developed. However, the GIA (also referred to as the invasion inhibition assay) is currently one of very few biological assays that are widely used to evaluate the potential of vaccine candidates in both animal and human studies; this is because the assay evaluates whether Abs induced by vaccination can bind to native Ag on the surface of parasites (or infected erythrocytes) and display an effector function in vitro. Given that a number of vaccine trials with AMA1 have been or soon will be conducted in malaria endemic areas (5), it is important to determine why the GIA results from vaccinated adult Malians were different from those of malaria-naive U.S. volunteers. There are two possible explanations for this phenomenon: 1) the AMA1 Abs induced by vaccination are qualitatively different from the Abs induced by natural infection; and/or 2) some fraction(s) of IgG from the Malians (naturally exposed individuals) interferes with the growth-inhibitory activity of AMA1 Abs induced by the AMA1-C1 vaccine. With regard to the latter possibility, in the case of Merozoite Surface Protein 1 (MSP1), another blood stage vaccine candidate, it has been shown that a proportion of anti-MSP1 Abs, called blocking Abs, which are found in people living in malaria-endemic areas, competes with an anti-MSP1 mAb capable of inhibiting merozoite invasion of erythrocytes in vitro, as judged by a competition ELISA and by a MSP1 processing assay (22, 23, 24). It has been proposed that these blocking Abs interfere with the activity of anti-MSP1 Abs that actually inhibit invasion. Like MSP1, the AMA1 protein is initially synthesized as a precursor, which then undergoes proteolytic cleavage (25, 26). It is possible that a portion of AMA1-specific Abs interfere with this proteolytic cleavage, thereby inhibiting invasion to erythrocytes (27). It may also be possible that there are other AMA1-specific Ab specificities that interfere with this activity. To address these possibilities, we affinity purified AMA1-specific Abs from both U.S. vaccinees and nonvaccinated individuals living in a malaria-endemic area of Mali and performed ELISA and GIA with the purified Abs. We chose to study the anti-AMA1 Abs prevalent in nonvaccinated Malian individuals, because if we purified the Ab from vaccinated Malians, we would be unable to separate or distinguish the AMA1-specific Abs elicited by infection and later vaccination. We are not aware of any previous study that directly compares antimalaria Abs to blood stage Ags that are induced by vaccination with those induced by natural infection. We have shown that AMA1-specific Abs from both of these study populations have similar biological activity in GIA at comparable concentrations. However, when non-AMA1 IgGs isolated from the sera of the Malian study participants, in particular malaria-specific IgGs isolated from the non-AMA1 IgGs, were mixed with AMA1 Abs obtained either from vaccinated U.S. volunteers or from nonvaccinated Malian adults, growth-inhibitory activity was substantially reduced. These results likely account for our previous observations in AMA1-immunized Malians and also have implications for interpretation of blood stage vaccine trials in malaria-endemic areas. Details of the trial will be described elsewhere (17). In brief, a single-blind, randomized, dose-escalating phase I clinical trial was conducted in 75 healthy volunteers immunized with AMA1-C1 malaria vaccine formulated on Alhydrogel with or without CPG 7909 (Coley Pharmaceuticals). The study was reviewed and approved by the Institutional Review Board of the National Institute of Allergy and Infectious Disease (Bethesda, MD), and by the University of Rochester Research Subjects Review Board (Rochester, NY). Written informed consent was obtained from all volunteers. Participants were healthy volunteers between 18 and 45 years old. Vaccinations were administered on days 0, 28, and 56. Postvaccination sera from this study were shown to recognize both the AMA1(3D7) and AMA1(FVO) proteins, as judged by ELISA (17). Plasma samples from five individuals with high levels of anti-AMA1 Ab (as determined by ELISA) on day 70 were collected 3 mo after the last immunization. To perform this study, from these five plasma samples, a pool was made using three of the samples, whereas the other two were tested individually. Furthermore, two more pools were made from sera collected on days 42 (2 wk postvaccination 2) and 70 (2 wk postvaccination 3): 1) of 75 volunteers, day 42 and 70 sera from 34 volunteers with high anti-AMA1 Ab levels were pooled; and 2) a pool was made using day 70 antisera from all 75 volunteers. Specimens were collected from participants of a longitudinal epidemiological study conducted in the village of Donéguébougou, Mali, where malaria transmission is seasonal and high (28). Individuals between the ages of 6 mo and 45 years were randomly selected from a village census and invited to participate in the study until a cohort of ∼200 study participants was assembled. Serum samples were collected from the volunteers at four cross-sectional visits between July 2002 and April 2003. Community permission was obtained from village elders, as well as approval from the ethical review committees of the Faculty of Medicine, Pharmacy, and Dentistry at the University of Bamako (Mali) and the National Institute of Allergy and Infectious Disease. Individual written informed consent was obtained from all participants or their guardians. Previous analysis of sera from the participants showed that both AMA1(3D7) and AMA1(FVO) were recognized to a comparable extent by ELISA. To perform this study, ∼800 serum samples (∼200 participants, 4 visits) were ranked based on their anti-AMA1 Ab level as judged by ELISA (regardless of age, blood-sampling day, etc.) and were divided into 4 serum pools. Mali-1 was a pool of sera with the lowest anti-AMA1 Ab level, and Mali-4 had the highest. From both the U.S. and Malian serum-plasma samples, total IgGs were purified as described previously (16). The protein concentration of total IgG was adjusted to 40 mg/ml. The AMA1-specific Abs in the total IgG preparation were isolated by affinity adsorption to AMA1(3D7) or AMA1(FVO) protein immobilized on normal human serum-activated Sepharose 4 Fast Flow (GH Healthcare) according to the manufacturer’s instructions. The AMA1 protein used was the same lot of cGMP-grade material as contained in the vaccine formulation. Total IgGs (1 ml of each) were loaded onto the column, and the IgG fraction that did not bind to the column was collected (non-AMA1(3D7) or non-AMA1(FVO) IgG). AMA1(3D7)- or AMA1(FVO)-specific Abs were eluted using elution buffer (0.1 M glycine, pH 2.7). Both non-AMA1 IgG and AMA1-specific Abs were dialyzed against RPMI 1640 and concentrated to 40 mg/ml (non-AMA1 IgG) or 150–300 μl of final product (AMA1 Abs). As a negative control, IgGs were purified from a serum pool collected from malaria-naive and unvaccinated U.S. volunteers, in the same way as described above. The standardized methodology for performing the ELISA (for both total IgG and IgG subclasses) and the GIA has been described previously (16, 29). An ELISA unit value of a standard was assigned as the reciprocal of the dilution giving an OD405 of 1 in a standardized assay. The optical density of individual test samples was converted into ELISA units using a standard curve generated by serially diluting the standard in the same plate; ELISA units of the standard were fixed once assigned, regardless of actual OD405 value of a standard curve in a plate. For clarity, only GIA data with anti-AMA1(3D7) and/or non-AMA1(3D7) IgGs against P. falciparum 3D7 parasites are presented in this paper. Experiments were also conducted using anti-AMA1(FVO) and/or non-AMA1(FVO) IgGs against P. falciparum FVO parasites, but because the results were comparable with those for P. falciparum 3D7, they are not presented here. To determine the avidity of anti-AMA1 Abs, total IgGs (i.e., primary Abs) were diluted to 2.5 ELISA units. A 15-min incubation step with varying concentrations of urea (from 0 to 5 M) in Tris-buffered saline (BioFluids) was performed between the primary and secondary Ab incubation steps. The remainder of the ELISA procedure was the same as described previously. The concentration of urea resulting in 50% of the original ELISA units (EC50) was calculated using linear regression. All of the data sets fit the linear regression models well (r2 > 0.94; data not shown). To determine the impact of malaria-specific IgGs from Mali non-AMA1(3D7) IgGs on anti-AMA1 Ab in GIA, three Mali non-AMA1(3D7) IgGs were prepared again from the Mali serum pools following the procedure mentioned above. A malaria extract of late trophozoite/schizont P. falciparum 3D7 was prepared by layering culture blood on a 60% Percoll gradient, centrifuging, freeze thawing, and then sonicating the cells several times. The protein concentration of the extract was measured with a bicinchoninic acid protein assay kit (Pierce). The malaria extract-specific Abs were isolated by affinity adsorption to the extract protein immobilized on Sepharose 4 Fast Flow. The Mali non-AMA1(3D7) IgGs (40 mg of each) were loaded onto the column and malaria-specific Abs were eluted, dialyzed against RPMI 1640, and concentrated to 160 μl of final product. As a negative control, 40 mg of total IgGs from a serum pool collected from malaria-naive and unvaccinated U.S. volunteers was loaded onto the malaria-extract affinity column and treated in the same way as described above. The activity of these malaria-specific IgGs was tested either alone or with U.S.-total IgG by GIA. Linear and nonlinear regression analyses were performed using Prism 5 (GraphPad Software). Best-fit formulations of the GIA data for both the dose-response curve and EC50 were calculated using logarithm-transformed ELISA units or Ab protein concentration. To compare multiple slopes of best-fit lines, analysis of covariance (ANCOVA) was performed followed by a post hoc Bonferroni test. Comparisons between EC50 values from the avidity test were performed using the Mann-Whitney U test. Correlations between Ab concentration (either ELISA units or micrograms per milliliter) and growth-inhibitory activity were assessed using a Spearman rank correlation test. All statistical tests were performed using Prism 5, and probability values <0.05 were considered significant. AMA1-specific Abs were purified from total IgG fractions obtained from the participants in the U.S. and Malian studies to compare the characteristics of these two types of Abs. To express the concentration of AMA1-specific Ab in a more general way, we first converted the Ab concentration as expressed in standardized ELISA units (OD-based Ab amount calculated from a standard curve run in duplicate on each plate), which we have used in previous publications, to mass values (i.e., micrograms per milliliter). When the ELISA units of the U.S.-AMA1(3D7)-specific Abs were plotted against the protein concentrations in micrograms per milliliter (Fig. 1⇓A), a linear relationship was observed (r2 = 0.98). Likewise, Mali-AMA1(3D7) Abs also showed a linear relationship between ELISA units and mass values (r2 = 0.99). Characteristic differences between U.S.- and Mali-anti-AMA1 IgGs as measured by ELISA. A, The ELISA units to AMA1–3D7 plates (x-axis) and protein concentrations (y-axis) of five U.S.-AMA1(3D7) Ab preparations and four Mali-AMA1(3D7) Abs. B, Conversion factor (CF, the protein concentration of anti-AMA Ab equivalent to 1 ELISA unit) as calculated by linear regression. Error bars represent 95% CIs. There is a significant difference between the four CFs (p < 0.0001 by ANCOVA test). C, The avidity of anti-AMA1 IgG was tested using total IgGs by incubating ELISA plates with increasing concentrations of urea. EC50 of individual samples and the mean of the group are shown for U.S. and Malian samples. Based on the best-fit lines, a conversion factor (CF, the protein concentration of Ab equivalent to 1 ELISA unit) was calculated for both the 3D7 and FVO allelic forms of AMA1 (Fig. 1⇑B). The four CFs were significantly different (p < 0.0001 by ANCOVA), and the CFs for U.S.-AMA1 Abs were significantly higher than that of Mali-AMA1 Abs for both Ags (p < 0.001 for both AMA1(3D7) and AMA1(FVO); post hoc Bonferroni test). These results indicate that U.S.-AMA1 Abs require a higher mass concentration of Ab to produce the same level of ELISA units as Mali-AMA1 Abs tested against the same Ag. Consequently, the two sets of Abs were compared further by analyzing the avidity and subclasses of Ag-specific IgG. Mean Ab avidity of U.S.-total IgG was slightly lower than the avidity of the Mali-total IgG, although there was greater variance in the avidities of the U.S.-total IgG samples (Fig. 1⇑C). As a result, there was no statistically significant difference between the mean avidities of U.S.- and Mali-total IgGs (Mann-Whitney U test). When anti-AMA1 IgG subclasses were measured, both U.S. and Malian samples were predominantly of the IgG1 subclass, with a small proportion of IgG3 and virtually no Ag-specific IgG2 or IgG4. Therefore, no differences in the distribution of Ag-specific IgG subclasses were observed between the U.S. and Malian volunteers (data not shown). The biological activity of U.S.- and Mali-AMA1(3D7) Abs was evaluated by a standardized in vitro GIA (Fig. 2⇓A) tested against P. falciparum 3D7 parasites. Similar to our previous observation with anti-AMA1 total IgG from volunteers in a phase I study of AMA1-C1 in the United States (16), when the anti-AMA1 ELISA units of individual samples were plotted against the percent inhibition as measured by GIA, there was a strong correlation between ELISA units and percent inhibition for both U.S.-AMA1(3D7) (Spearman rank correlation; rs = 0.97, 95% confidence interval (CI) 0.92–0.99, p < 0.0001) and Mali-AMA1(3D7) Abs (rs = 0.97, 95% CI 0.90–0.99, p < 0.0001). When the ELISA units were log transformed, the relationship followed a symmetrical sigmoid curve (r2 = 0.97 and 0.99 for the U.S.- and Mali-AMA1 Abs, respectively). The EC50 of the U.S.-AMA1(3D7) Abs (1570 ELISA units; 95% CI 1368–1802) was 1.5-times higher than that of Mali-AMA1(3D7) Abs (1002 ELISA units; 95% CI 895-1122). The EC50 of U.S.-AMA1(3D7) Abs overlapped with the EC50 of U.S.-total IgG (1647 ELISA units; 95% CI 1566–1732), but the Mali-total IgG had higher inhibitory activity at the same level of anti-AMA1 ELISA units (Fig. 2⇓A). The latter finding presumably reflects the presence of non-AMA1 IgGs with biological activity against P. falciparum. Biological activity of U.S.- and Mali-AMA1(3D7) Abs against P. falciparum 3D7 parasites judged by in vitro GIA. A, Five U.S.-AMA1(3D7) Abs (U.S.-1–5) and four Mali-AMA1(3D7) Abs (Mali-1–4) were tested at 5, 15, and 30% dilutions (v/v) by GIA. The anti-AMA1(3D7) ELISA units in the GIA well (x-axis) are plotted against percent inhibition (y-axis) to P. falciparum 3D7 parasites. Four Mali-total IgGs were also tested at 30% (v/v). The dotted line represents the best-fit of the data from a study where 205 total IgGs of the U.S. vaccinees in the same AMA1-C1 human trial were tested by GIA (17 ). B, The Ab concentrations of U.S.- and Mali- AMA1(3D7) Abs in the GIA well are plotted on the x-axis, instead of ELISA units. The GIA data were replotted using the protein concentration of Ab in mass units (i.e., micrograms per milliliter) in the GIA well on the x-axis (Fig. 2⇑B), instead of ELISA units. Similar to results shown in Fig. 2⇑A, both U.S.- and Mali-AMA1(3D7) Abs showed strong correlations between protein concentration and percent inhibition (U.S.-AMA1(3D7) Abs: rs = 0.97, 95% CI 0.91–0.99, p < 0.0001; Mali-AMA1(3D7) Abs: rs = 0.99, 95% CI 0.95–1.00, p < 0.0001). However, the difference between the EC50 of U.S.-AMA1(3D7) Abs (100.3 μg/ml; 95% CI 88.9–113.2) and the EC50 of Mali-AMA1(3D7) Abs (46.3 μg/ml; 95% CI 40.0–53.7) was greater than the difference between the EC50 values of the two when calculated using ELISA units. To investigate whether Mali-AMA1(3D7) Abs induced by natural infection include blocking Abs, similar to the proposal for MSP1 (22, 23), we performed GIA experiments with mixtures of two different IgG samples: 1) a mixture of U.S.-AMA1(3D7) Abs with each of the four Mali-AMA1(3D7) Abs; and 2) a mixture of two of the Mali-AMA1(3D7) Abs (Fig. 3⇓). As shown in Fig. 3⇓A, when the expected ELISA units of the Ab mixtures were plotted on the x-axis (e.g., when an Ab sample of 2000 ELISA units was mixed with a sample of 1000 ELISA units, the expected ELISA unit of the mixture was 3000, etc. ), the percent inhibition of the mixture followed the same dose-response curve (dotted line) generated by the GIA result when individual (i.e., unmixed) samples were tested. The same data were replotted using the protein concentration of the mixtures in mass units (i.e., micrograms per milliliter) on the x-axis (Fig. 3⇓B). Whereas the data of the U.S.-Mali mixtures overlapped with the best-fit curve calculated from GIA results of the individual samples, the data of the Mali-Mali mixture in Fig. 3⇓B were less congruent with the best-fit curve compared with the same Mali-Mali mixture data in Fig. 3⇓A. Biological activity of mixtures of U.S.- and Mali-AMA1(3D7) Abs against P. falciparum 3D7 parasites as judged by GIA. A, Mixtures of U.S.-AMA1(3D7) (5% v/v) and Mali-AMA1(3D7) Ab (5% v/v) or of different Mali-AMA1(3D7) Abs (5% v/v each) were tested by GIA. The sum of anti-AMA1(3D7) ELISA units for the two mixed IgGs (i.e., the estimated number of units for the mixture) are plotted on the x-axis. The dotted line represents the best-fit of the same U.S.- and Mali-AMA1 (3D7) IgG data sets as in Fig. 2⇑A. B, The Ab concentrations (micrograms per milliliter) of Abs in the GIA well are plotted on the x-axis, instead of ELISA units. The dotted line represents the best-fit of the U.S.- and Mali-AMA1 (3D7) IgG data sets as in Fig. 2⇑B. Because U.S.- and Mali-AMA1(3D7) Abs showed similar biological activity in vitro when they displayed similar ELISA units and did not interfere with each other in the GIA, we next tested the fraction of total IgG that did not bind to AMA1(3D7) (non-AMA1(3D7) IgG) for its effects on growth-inhibitory activity. The U.S.-total IgG depleted of Abs to AMA1(3D7) (U.S.-non-AMA1(3D7) IgG) contained <6% of the ELISA units when tested on ELISA plates coated with AMA1(3D7) as compared with the original U.S.-total IgG (Table I⇓) and showed <3% inhibition to P. falciparum 3D7 parasites. The Mali-non-AMA1(3D7) IgGs showed approximately the same level of residual anti-AMA1(3D7) Abs as U.S.-non-AMA1(3D7) IgG, as judged by ELISA. However, when the growth-inhibitory activity was measured using the Mali-non-AMA1(3D7) IgGs against 3D7 parasites, the IgGs showed levels of growth-inhibitory activity comparable with those of the original (i.e., predepletion) Mali-total IgGs. That is, no major loss of growth-inhibitory activity was observed after removal of nearly all the Malian AMA1–3D7 Ab specificities, based on the anti-AMA1(3D7) ELISA units of the IgGs. To assess the potential interference of U.S.- and Mali-non-AMA1(3D7) IgGs on the biological activity of U.S.-anti-AMA1(3D7) Ab, GIA was performed using 3D7 parasites (Fig. 4⇓). U.S.-non-AMA1(3D7) IgG did not show growth-inhibitory activity at either 0.4 mg/ml (Fig. 4⇓A) or 4 mg/ml (Fig. 4⇓B), whereas the Mali-non-AMA1(3D7) IgGs showed biological activity at both concentrations. When U.S.-non-AMA1(3D7) IgGs were mixed with U.S.-AMA1(3D7) Abs, the U.S.-non-AMA1(3D7) IgG (at either 0.4 mg/ml or 4 mg/ml) did not change the growth-inhibitory activity of U.S.-AMA1(3D7) Abs. 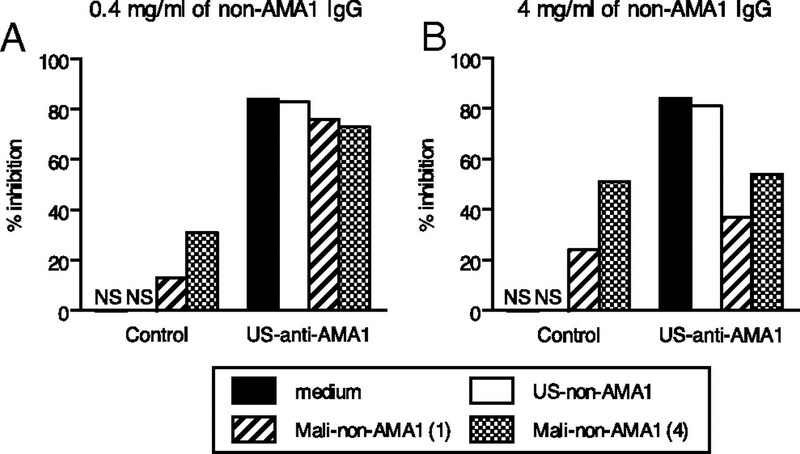 When 0.4 mg/ml Mali-non-AMA1(3D7) IgGs were mixed with U.S.-AMA1(3D7) Abs (Fig. 4⇓A), the mixture showed an 8% (with non-AMA1 IgG from the Mali-1) and 11% (Mali-4) reduction of growth-inhibitory activity compared with U.S.-AMA1(3D7) Abs alone. When U.S.-AMA1(3D7) Abs were mixed with 4.0 mg/ml of Mali-non-AMA1(3D7) IgGs (Fig. 4⇓B), there was a clear reduction in the percent inhibition of P. falciparum 3D7 growth (47% reduction for Mali-1 and 30% for Mali-4). Similar to the mixture experiment with U.S.-AMA1(3D7) Abs, 4.0 mg/ml Mali-non-AMA1(3D7) also showed a clear reduction in the percent inhibition of Mali-AMA1(3D7) Abs (46% reduction), whereas 4.0 mg/ml U.S.-non-AMA1(3D7) IgG did not change the percent inhibition of Mali-AMA1 (3D7) Ab (2% reduction). Mali-non-AMA1(3D7) IgG reduces growth-inhibitory activity of U.S.-AMA1(3D7) Ab against P. falciparum 3D7 parasites. Negative control IgGs (30% v/v), which were purified from a pool of malaria-naive U.S. normal serum, or U.S.-AMA1(3D7) Ab (30% v/v), were mixed with either medium (positive control) or non-AMA1(3D7) IgGs at 0.4 mg/ml (A) or 4 mg/ml (B). The growth-inhibitory activity of the mixtures was tested against P. falciparum 3D7 parasites. U.S.-AMA1(3D7) Ab and U.S.-non-AMA1(3D7) IgGs were purified from U.S.-4 total IgG and Mali-non-AMA1(3D7) IgGs were from Mali-1 or Mali-4 total IgGs. NS, percent inhibition was in the range of ±5%. To address whether Mali-non-AMA1(3D7) IgGs could reduce the growth-inhibitory activity of anti-AMA1 Abs in the presence of other specificities of IgG and whether all four Mali-non-AMA1(3D7) IgG preparations had such modulating activity, we conducted an independent study in which U.S.-total IgG was incubated separately with each of the four Mali-non-AMA1(3D7) IgGs (Fig. 5⇓). As shown in Fig. 5⇓A, addition of 0.4 mg/ml Mali-non-AMA1(3D7) IgGs did not markedly change the growth-inhibitory activity of U.S.-total IgG (<11% reduction). On the other hand, when 4 mg/ml Mali-non-AMA1(3D7) IgGs were mixed with U.S.-total IgG, all four IgGs reduced the growth-inhibitory activity by >22% compared with the U.S.-total IgG alone (Fig. 5⇓B). To confirm that the inhibitory effect of the non-AMA1(3D7) IgG was specific to the IgGs from Malians, a mixture of U.S.- (or Mali-) AMA1(3D7) Abs with U.S.-non-AMA1(3D7) IgG at 10.0 mg/ml was tested. The U.S.-non-AMA1(3D7) IgG did not result in a reduction of the growth-inhibitory activity of either U.S. or Malian anti-AMA1(3D7) Abs, even when tested at a 2.5-fold higher protein concentration than the tests using Mali-non-AMA1(3D7) IgGs in Figs. 4⇑B and 5B (data not shown). Mali-non-AMA1(3D7) IgGs reduce growth-inhibitory activity of U.S.-total IgG against P. falciparum 3D7 parasites. U.S.-total IgG (12 mg/ml) were mixed with medium (positive control) or with Mali-non-AMA1(3D7) IgGs at 0.4 (A) or 4 (B) mg/ml, and the growth-inhibitory activity of the mixtures was tested. ND, percent inhibition was 0 by definition. To determine whether the interference in the growth-inhibitory activity of Mali non-AMA1(3D7) IgG was due to Abs specific for other malaria Ags, malaria-specific IgGs were affinity purified from three Mali non-AMA1(3D7) IgGs and tested by GIA either alone or with U.S.-total IgG (Fig. 6⇓). The malaria-specific IgGs by themselves showed <5% inhibition at the concentration tested. However, the same concentration of malaria-specific IgGs from Mali non-AMA1(3D7) IgG reduced the percent inhibition of U.S.-total IgG (32–46% reduction), whereas IgG preparations from malaria-naive total IgG (Normal) did not change the growth-inhibitory activity of U.S.-total IgG. Malaria-specific IgGs from Mali-non-AMA1(3D7) IgGs reduce growth-inhibitory activity of U.S.-total IgG against P. falciparum 3D7 parasites. Malaria-specific IgGs from Mali-non-AMA1(3D7) IgGs (Mali 1–3) and from negative control IgG (normal IgG purified from a pool of malaria-naive U.S. normal serum), were tested (50% v/v in GIA well) either alone (left) or with U.S.-total IgG (10 mg/ml, right). As a positive control, the U.S.-total IgG was also tested alone (medium, ▪). NS, percent inhibition was in the range of ±5%. In this study, we compared the in vitro P. falciparum growth-inhibitory activity of human Abs induced by natural infection (using samples from individuals living in Mali) and by vaccination with the AMA1-C1 (in malaria-naive U.S. volunteers) and made two important findings. The first is that AMA1-specific Abs induced by either natural infection or vaccination show comparable levels of growth-inhibitory activity in vitro at the same level of ELISA units. The second is that malaria-specific, but non-AMA1, IgGs from naturally exposed Malian individuals reduced the biological activity of AMA1-specific Abs in vitro. For clarity, although GIA results are presented here for anti-AMA1(3D7) and/or non-AMA1(3D7) IgGs against P. falciparum 3D7, we have conducted identical studies with anti-AMA1(FVO) and/or non-AMA1(FVO) IgGs against FVO parasites and obtained similar results, establishing that this is not limited to a single AMA1 sequence or parasite strain. We affinity purified AMA1-specific Abs from the total IgG fraction from U.S. and Malian volunteers, particularly because Malian sera contain a variety of Abs against different malaria proteins in addition to AMA1, making it difficult to compare the characteristics of the two AMA1-specific Abs. For both total IgGs and AMA1-specific Abs, there is a correlation between the level of anti-AMA1 ELISA units of the sample in the GIA well and its growth-inhibitory activity. However, as shown in Fig. 1⇑A, the Mali-total IgG had higher parasite-inhibitory activity than U.S.-total IgG at equivalent levels of anti-AMA1 ELISA units, which is similar to previous observations in phase I trials of the AMA1-C1 vaccine in Malian and U.S. adults (16, 21). The higher growth-inhibitory activity of the Malian total IgG is likely due to antimalarial Abs with specificities other than AMA1. The data suggest that Malians with high levels of anti-AMA1 Abs are likely to have high levels of Abs to other malarial Ags, as has been reported in other epidemiological studies (30, 31), and as a consequence, the total IgG with higher anti-AMA1 ELISA units showed higher growth-inhibitory activity in vitro. Our findings also show the importance of affinity purification of specific IgGs to compare the activity of two types of Abs, as shown in both Table I⇑ and Fig. 1⇑. Both U.S.- and Mali-non-AMA1 IgGs contained <6% of anti-AMA1(3D7) ELISA units as compared with the original total IgGs, and U.S.-non-AMA1 IgG showed a negligible level of biological activity to the parasites, indicating that the affinity purification was highly effective. Surprisingly, however, the Mali-non-AMA1 IgGs showed levels of growth-inhibitory activity comparable with that of the original Mali-total IgGs before affinity purification. Thus, despite the removal of nearly all the anti-AMA1(3D7) Abs, the GIA result against 3D7 parasites was not markedly affected. These data are in agreement with our previous observation that preincubation with AMA1 protein did not reverse the growth-inhibitory activity of total IgG samples taken from Malian volunteers even though the IgG preparation included significant levels of anti-AMA1 Abs as judged by ELISA (21). These data clearly show that non-AMA1 IgGs from Malians have biological activity in vitro, because the very limited remaining anti-AMA1–3D7 IgGs were too low in concentration to inhibit the growth of homologous P. falciparum 3D7 parasites. In addition, the data also suggest that the growth-inhibitory activity of Abs directed to two (or more) different parasite Ags are not necessarily additive, although mixing of AMA1 Abs from two different sources did show additive effects in a predictable manner (Fig. 3⇑). In other words, even though preincubation of IgGs from people living in an endemic area with an Ag does not change the growth-inhibitory activity in the GIA, such a finding does not prove that Abs against that particular Ag have no biological activity. GIA experiments we have performed using rabbit anti-AMA1 and anti-MSP1 Abs have also shown nonadditive effects (our unpublished data). Although we have shown that growth-inhibitory activity is a function of Ab level (measured in ELISA units) in both preclinical studies in animals and in a clinical trial in U.S. vaccinees (16, 18, 19, 20), to express the concentration of specific Ab in a more generalizable way, we converted the arbitrary ELISA units to actual protein concentration (i.e., micrograms per milliliter) using the affinity purified AMA1-specific Abs. As shown in Fig. 1⇑B, there were significant differences in the CF (the protein concentration of Ab equivalent to 1 ELISA unit) between U.S.- and Mali-AMA1 Abs against both AMA1(3D7) and AMA1(FVO). Although it is possible that the affinity purification method used in this study damaged the Abs and resulted in the difference observed in the CF, we do not believe that is the case. As shown in Fig. 2⇑A, U.S.-AMA1 Abs and U.S.-total IgG showed the same level of growth-inhibitory activity at the same level of ELISA units. Similarly, we purified AMA1-specific Ab from animals vaccinated with AMA1 (mice, rabbits and monkeys) and did not find a reduction in growth-inhibitory activity when comparing AMA1-specific Abs to total IgGs (K. Miura et al., manuscript in preparation). Taken together, this indicates that the affinity purification method utilized did not significantly diminish the binding activity of the Ab. No significant differences in the avidity of anti-AMA1 IgGs or the distribution of anti-AMA1 IgG subclasses were detected between samples collected from U.S. and Malian volunteers. However, the mean value of EC50 in U.S.-total Abs was lower than that of Mali-total Abs and the small sample size in this study may have made it difficult to show a significant difference. While an additional study (e.g., with more test samples) is needed to clarify whether the difference in CF between U.S. and Mali-AMA1 Abs is due to differences in avidity and/or other factor(s), the results of the CF calculations show that U.S.-AMA1 Abs requires a greater mass concentration of Ab to give the same level of ELISA units compared with Malian Abs tested using the same Ag. Because it is well known that repeated infection induces Ab maturation, the difference in CF might reflect the fact that Malian AMA1 Abs elicited by multiple infections over a long period of time were of higher affinity than U.S.-AMA1 Abs which were elicited by only three immunizations with the AMA1-C1 vaccine. Establishing the CF for the anti-AMA1 Abs allowed us to compare our results with those of other investigators. Hodder et al. (14) have previously shown that human affinity-purified AMA1–3D7-specific IgG from pooled plasma from people living in Papua New Guinea displayed ∼75% inhibition to P. falciparum 3D7 parasites when tested at a concentration of 100 μg/ml. On the basis of the best-fit curves of our data, we estimate that 75% growth inhibition of our U.S.-AMA1(3D7) Abs would occur at a concentration of 188.4 μg/ml (95% CI 158.1–231.2), whereas for Mali-AMA1(3D7) Abs the corresponding figure would be 90.6 μg/ml (95% CI 74.0–114.0). By expressing the Ab level in micrograms per milliliter, we can show that Mali-AMA1 Abs and Papua New Guinea-anti-AMA1 Abs have similar biological activities in vitro when tested at the same Ab concentration. However, our data (Figs. 2⇑ and 3⇑) show that the growth-inhibitory activities of U.S.- and Mali-AMA1 Abs overlap somewhat better when we used ELISA units to express the amount of anti-AMA1 Ab. Further studies are required to determine whether or not the level of Ab as measured by ELISA is a better predictor of the biological activity of anti-AMA1 Ab judged by GIA. As noted previously, Guevara Patino et al. (22) have reported that a fraction of human anti-MSP1 Abs blocks the invasion-inhibitory activity of mouse anti-MSP1 mAb, mAb 12.8. However, the same human Abs did not block the biological activity of another inhibitory anti-MSP1 mAb, mAb 12.10. Therefore, there was no clear evidence that such blocking Abs interfere with the activity of human polyclonal antimalarial Abs (including anti-MSP1 Abs) in a biological assay, such as GIA. As shown in Fig. 3⇑A, the additive effects observed between the two types of anti-AMA1 Abs (U.S.- and Mali-AMA1 Abs) demonstrate that there is no clear biological interference between anti-AMA1-specific Abs induced by vaccination and by natural infection. However, when anti-AMA1 Abs, either from U.S. vaccinees and nonvaccinated Malian adult, were mixed with Mali-non-AMA1 IgGs, consistent reductions in growth-inhibitory activity of anti-AMA1 Abs were observed. These mixing experiments (Figs. 3–6⇑⇑⇑⇑) suggest that the discrepancy in GIA results between our previous AMA1-C1 vaccine trials in a malaria-endemic area of Africa (Mali) and that a nonendemic naive population in the U.S. was likely due to the effects of Mali-non-AMA1 IgGs, and not from qualitative differences in the AMA1-specific Abs obtained from the two study groups. To our knowledge, this is the first report showing that IgGs from people who live in malaria-endemic areas can reduce the growth-inhibitory activity of human antimalarial polyclonal Abs directed to an Ag expressed during the erythrocytic stage of parasites. 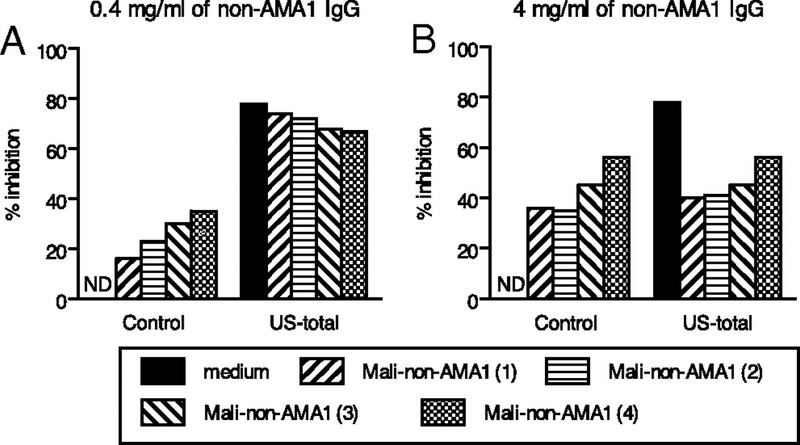 Because non-AMA1 IgGs from Malians living in a malaria-endemic area themselves have growth-inhibitory activity, reduction of inhibition can be observed only when a sufficient quantity of AMA1 Ab, which shows more growth-inhibitory activity than Mali-non-AMA1 IgGs, is used in the GIA experiment. Actually, when 0.4 mg/ml Mali-non-AMA1 IgGs were tested, the reduction in growth-inhibitory activity (<11% inhibition differences) was within the range of error of the GIA (±∼10% inhibition; unpublished data), so it is difficult to conclude whether the reduction was real or not. On the other hand, when 4 mg/ml Mali-non-AMA1 IgG was used for the mixture experiments (Figs. 4⇑ and 5⇑), a clear reduction (i.e., >20%) was observed, despite 4 mg/ml non-AMA1 IgGs itself showing higher growth-inhibitory activity than when tested at 0.4 mg/ml. Thus, showing the reduction effect of Mali-non-AMA1 IgGs experimentally was not straightforward. However, the levels of anti-AMA1 Ab used in this study (2000–3000 ELISA units in each GIA well) are comparable with those induced by the AMA1-C1 vaccine in human trials and the concentration of non-AMA1 IgG tested (4 mg/ml) was one-half to one-fifth of the concentration of total IgG found in human serum. Therefore, it is possible that Mali-non-AMA1 IgGs interfere with growth-inhibitory activity of AMA1 Ab at physiological concentrations. We further investigated whether the interfering activity of Mali-non-AMA1(3D7) IgGs against anti-AMA1 Abs is due to Abs to other malaria Ags or to nonmalaria Abs. As shown in Fig. 6⇑, malaria-specific IgGs from Mali-non-AMA1(3D7) IgGs interfered with the growth-inhibitory activity of anti-AMA1 Abs in GIA. Although all Mali-non-AMA1(3D7) IgG and also Mali-malaria-specific IgG samples tested in this study interfered with the biological activity of the U.S.-total IgG (Fig. 5⇑ and 6⇑), it is not clear whether all individuals have Abs capable of this activity given that all four fractions were obtained by pooling different samples. We also do not know whether IgGs from young children or infants who have not had many malaria episodes have similar capability. Although AMA1 vaccination by itself did not induced interfering Abs in the U.S. trial (Fig. 4⇑), it is possible that the vaccination of people who live in malaria-endemic areas changes the effect and/or prevalence of interfering Ab in vaccinees. Because we had not expected to see this interference effect on GIA when we designed the epidemiology study (from which we made the serum pools) and the AMA1 trial in Malian adults, we did not collect enough individual serum/plasma to perform this type of study. We plan to conduct other epidemiology studies and vaccine trials in Mali, and once additional serum/plasma will be available, we will attempt to answer the questions mentioned above. At present we do not know what antimalarial Ab specificities interfere with the growth-inhibitory activity of anti-AMA1 Ab or how this interference is mediated. We can speculate that malaria infection induces an array of Ab specificities, some of which reduce the effector function of other antimalarial Abs. Such interfering Abs may allow the malaria parasite to maintain persistent levels of parasitemia in the human host. There are currently no accepted in vitro correlations of protective immunity to malaria, so that it is unknown whether the biological activity that we are measuring in vitro reflects such immunity in vivo. However, the GIA (or IIA) is one assay that allows evaluation of Ab effector activity against viable parasites, and it has been used to evaluate the biological activity of Abs induced by vaccine candidates in phase I trials. Therefore, further investigation into the possible existence of Abs that interfere with others, as in the study presented here, is extremely important for future malaria blood stage vaccine development, and blood stage vaccine trials in endemic areas should take these findings into account in evaluating potential in vitro correlates of protective immune responses as well as vaccine efficacy. We are grateful to all volunteers who participated in the clinical trials. We also appreciate Drs. John Treanor, Ruth Ellis, and Allan Saul for contributions to the human trials. ↵1 This study was funded in part by the PATH/Malaria Vaccine Initiative and the Intramural Program of the National Institute of Allergy and Infectious Diseases, National Institutes of Health. ↵3 Current address: PATH Malaria Vaccine Initiative, Bethesda, MD. ↵4 Current address: Albert B. Sabin Vaccine Institute, Washington, DC. ↵5 Current address: Division of Imaging Sciences, King’s College London, The Rayne Institute, Thomas’ Hospital, London, United Kingdom. ↵6 Abbreviations used in this paper: AMA1, Apical Membrane Antigen 1; GIA, growth inhibition assay; MSP1, Merozoite Surface Protein 1; CF, conversion factor; ANCOVA, analysis of covariance; CI, confidence interval. Sachs, J., P. Malaney. 2002. The economic and social burden of malaria. Nature 415: 680-685. Mahanty, S., A. Saul, L. H. Miller. 2003. Progress in the development of recombinant and synthetic blood-stage malaria vaccines. J. Exp. Biol. 206: 3781-3788. Peterson, M. G., V. M. Marshall, J. A. Smythe, P. E. Crewther, A. Lew, A. Silva, R. F. Anders, D. J. Kemp. 1989. Integral membrane protein located in the apical complex of Plasmodium falciparum. Mol. Cell. Biol. 9: 3151-3154. Remarque, E. J., B. W. Faber, C. H. Kocken, A. W. Thomas. 2008. Apical membrane antigen 1: a malaria vaccine candidate in review. Trends Parasitol. 24: 74-84. Triglia, T., J. Healer, S. R. Caruana, A. N. Hodder, R. F. Anders, B. S. Crabb, A. F. Cowman. 2000. Apical membrane antigen 1 plays a central role in erythrocyte invasion by Plasmodium species. Mol. Microbiol. 38: 706-718. Kato, K., D. C. Mayer, S. Singh, M. Reid, L. H. Miller. 2005. Domain III of Plasmodium falciparum apical membrane antigen 1 binds to the erythrocyte membrane protein Kx. Proc. Natl. Acad. Sci. USA 102: 5552-5557. Mitchell, G. H., A. W. Thomas, G. Margos, A. R. Dluzewski, L. H. Bannister. 2004. Apical membrane antigen 1, a major malaria vaccine candidate, mediates the close attachment of invasive merozoites to host red blood cells. Infect. Immun. 72: 154-158. Collins, W. E., D. Pye, P. E. Crewther, K. L. Vandenberg, G. G. Galland, A. J. Sulzer, D. J. Kemp, S. J. Edwards, R. L. Coppel, J. S. Sullivan, C. L. Morris, R. F. Anders. 1994. Protective immunity induced in squirrel monkeys with recombinant apical membrane antigen-1 of Plasmodium fragile. Am. J. Trop. Med. Hyg. 51: 711-719. Deans, J. A., A. M. Knight, W. C. Jean, A. P. Waters, S. Cohen, G. H. Mitchell. 1988. Vaccination trials in rhesus monkeys with a minor, invariant Plasmodium knowlesi 66 kD merozoite antigen. Parasite Immunol. 10: 535-552. Stowers, A. W., M. C. Kennedy, B. P. Keegan, A. Saul, C. A. Long, L. H. Miller. 2002. Vaccination of monkeys with recombinant Plasmodium falciparum apical membrane antigen 1 confers protection against blood-stage malaria. Infect. Immun. 70: 6961-6967. Polley, S. D., T. Mwangi, C. H. Kocken, A. W. Thomas, S. Dutta, D. E. Lanar, E. Remarque, A. Ross, T. N. Williams, G. Mwambingu, et al 2004. Human antibodies to recombinant protein constructs of Plasmodium falciparum apical membrane antigen 1 (AMA1) and their associations with protection from malaria. Vaccine 23: 718-728. Nebie, I., A. Diarra, A. Ouedraogo, I. Soulama, E. C. Bougouma, A. B. Tiono, A. T. Konate, R. Chilengi, M. Theisen, D. Dodoo, et al 2007. Humoral responses to Plasmodium falciparum blood stage antigens and association with incidence of clinical malaria in children living in an area of seasonal malaria transmission in Burkina Faso, West Africa. Infect. Immun. 76: 759-766. Hodder, A. N., P. E. Crewther, R. F. Anders. 2001. Specificity of the protective antibody response to apical membrane antigen 1. Infect. Immun. 69: 3286-3294. Nair, M., M. G. Hinds, A. M. Coley, A. N. Hodder, M. Foley, R. F. Anders, R. S. Norton. 2002. Structure of domain III of the blood-stage malaria vaccine candidate. Plasmodium falciparum apical membrane antigen 1 (AMA1). J. Mol. Biol. 322: 741-753. Malkin, E. M., D. J. Diemert, J. H. McArthur, J. R. Perreault, A. P. Miles, B. K. Giersing, G. E. Mullen, A. Orcutt, O. Muratova, M. Awkal, et al 2005. Phase 1 clinical trial of apical membrane antigen 1: an asexual blood-stage vaccine for Plasmodium falciparum malaria. Infect. Immun. 73: 3677-3685. Giersing, B., K. Miura, R. Shimp, J. Wang, H. Zhou, A. Orcutt, A. Stowers, A. Saul, L. H. Miller, C. Long, S. Singh. 2005. Posttranslational modification of recombinant Plasmodium falciparum apical membrane antigen 1: impact on functional immune responses to a malaria vaccine candidate. Infect. Immun. 73: 3963-3970. Mullen, G. E., B. K. Giersing, O. Ajose-Popoola, H. L. Davis, C. Kothe, H. Zhou, J. Aebig, G. Dobrescu, A. Saul, C. A. Long. 2006. Enhancement of functional antibody responses to AMA1-C1/Alhydrogel, a Plasmodium falciparum malaria vaccine, with CpG oligodeoxynucleotide. Vaccine 24: 2497-2505. Miura, K., H. Zhou, O. V. Muratova, A. C. Orcutt, B. Giersing, L. H. Miller, C. A. Long. 2007. In immunization with Plasmodium falciparum apical membrane antigen 1, the specificity of antibodies depends on the species immunized. Infect. Immun. 75: 5827-5836. Guevara Patino, J. A., A. A. Holder, J. S. McBride, M. J. Blackman. 1997. Antibodies that inhibit malaria merozoite surface protein-1 processing and erythrocyte invasion are blocked by naturally acquired human antibodies. J. Exp. Med. 186: 1689-1699. Nwuba, R. I., O. Sodeinde, C. I. Anumudu, Y. O. Omosun, A. B. Odaibo, A. A. Holder, M. Nwagwu. 2002. The human immune response to Plasmodium falciparum includes both antibodies that inhibit merozoite surface protein 1 secondary processing and blocking antibodies. Infect. Immun. 70: 5328-5331. Okech, B. A., P. H. Corran, J. Todd, A. Joynson-Hicks, C. Uthaipibull, T. G. Egwang, A. A. Holder, E. M. Riley. 2004. Fine specificity of serum antibodies to Plasmodium falciparum merozoite surface protein, PfMSP-119, predicts protection from malaria infection and high-density parasitemia. Infect. Immun. 72: 1557-1567. Howell, S. A., C. Withers-Martinez, C. H. Kocken, A. W. Thomas, M. J. Blackman. 2001. Proteolytic processing and primary structure of Plasmodium falciparum apical membrane antigen-1. J. Biol. Chem. 276: 31311-31320. Narum, D. L., A. W. Thomas. 1994. Differential localization of full-length and processed forms of PF83/AMA-1 an apical membrane antigen of Plasmodium falciparum merozoites. Mol. Biochem. Parasitol. 67: 59-68. Dutta, S., J. D. Haynes, J. K. Moch, A. Barbosa, D. E. Lanar. 2003. Invasion-inhibitory antibodies inhibit proteolytic processing of apical membrane antigen 1 of Plasmodium falciparum merozoites. Proc. Natl. Acad. Sci. USA 100: 12295-12300. Dicko, A., I. Sagara, D. Diemert, M. Sogoba, M. B. Niambele, A. Dao, G. Dolo, D. Yalcouye, D. A. Diallo, A. Saul, et al 2007. Year-to-year variation in the age-specific incidence of clinical malaria in two potential vaccine testing sites in Mali with different levels of malaria transmission intensity. Am. J. Trop. Med. Hyg. 77: 1028-1033. Miura, K., A. C. Orcutt, O. V. Muratova, L. H. Miller, A. Saul, C. A. Long. 2008. Development and characterization of a standardized ELISA including a reference serum on each plate to detect antibodies induced by experimental malaria vaccines. Vaccine 26: 193-200. Johnson, A. H., R. G. Leke, N. R. Mendell, D. Shon, Y. J. Suh, D. Bomba-Nkolo, V. Tchinda, S. Kouontchou, L. W. Thuita, A. M. van der Wel, et al 2004. Human leukocyte antigen class II alleles influence levels of antibodies to the Plasmodium falciparum asexual-stage apical membrane antigen 1 but not to merozoite surface antigen 2 and merozoite surface protein 1. Infect. Immun. 72: 2762-2771. Biswas, S., R. K. Seth, P. K. Tyagi, S. K. Sharma, A. P. Dash. 2008. Naturally acquired immunity and reduced susceptibility to falciparum malaria in two subpopulations of endemic eastern India. Scand. J. Immunol. 67: 177-184.